There really is something terribly compelling about Nephi. It’s hard not to be won over by his absolute commitment and tenacity. I want to bracket all my inevitable reading of an older political authority justifying the legitimacy of his reign, countering his opposition’s narratives concerning crucial events at the genesis. Instead, I want here to simply let myself be taken in by a youth who displays this unyielding faith and optimism. It strikes me that this is precisely the attitude and commitment that brings about change. How—in the context of ancient Holy Land Jerusalem—can God transplant a faithful family, a family whose faith is rooted in the framework of their people’s having obtained a promised land and established a House of God? It would seem that either God would need a family whose faith was secondary, thin, perhaps non-existent (i.e., they weren’t all that faithfully Jewish and so weren’t committed to the Holy Land); or else God would have to give up on the idea of transplanting them. But here’s a third option: find someone like Nephi who will hold to what he’s been given in revelation and jump into the abyss. Assuming he doesn’t die—that is, assuming Providence—a new land of promise is indeed a possibility. Looking at Nephi’s persuasive rhetoric, I can’t help but notice the difference between the explanation we get here for why the plates are needed and the explanation given when Nephi quoted Lehi. A difference in time and a difference in perspective have now brought us to the idea that the records are for a preservation of their language and their ability to read the words of the prophets. This strikes me as quintessential Restoration here—these are the same values upon which Joseph Smith operated. First, fully enfranchise a new prophet, a new founding vision and narrative, a new revelation for a new dispensation. On its own, this seems to cut off the need for the ancient prophets—Brigham Young in his heady zeal sometimes leaned this way. But for the Restoration, Joseph’s enfranchisement as a prophet took place via his restoration of ancient prophets. The marriage of the ancient and the new. Nephi articulates the same. Lehi’s first act after his full enfranchisement and break with the Jews is to send his sons back to get the Jews’ old record. And this is what Nephi latches onto. If we want to follow our modern prophet, we’ve got to obtain and maintain the words of the ancient prophets. Next we see not just Nephi’s faith—which is prodigious enough on its own, but which is also hugely dangerous, and as we occasionally see, a prodigiously insensitive and bludgeoning force. We also see his commitment and trust in God married with his own creativity and ingenuity. And this is where things get really interesting. God commands them to return for the record. Laman, who’s opposed to the entire Lehi Project, nevertheless is willing to sacrifice and lend his own honest efforts to obtaining the record. Why would God not honor Laman’s sacrifice and efforts? I can’t help but think of the poorly described events surrounding Cain’s and Able’s sacrifices, where the Lord comes out looking rather partial and unfair. But God is a God that hides, and Laman’s efforts end in failure. Nephi’s tenacity and creativity lead to a second attempt—and I can’t help but think that like me, God was genuinely impressed with Nephi’s efforts. Nevertheless, this ends in a second failure. Here we see the workings of our God and a focus on process as much as ends. And here we see how terribly difficult it is for us to be satisfied with such a focus. When God commands Joseph to head out on Zion’s Camp, we damn well expect to see Zion redeemed. When God commands me to have and provide for a family, and when I not only offer my sincere efforts, but also all the creativity and ingenuity I possess, it is an understatement to call it a mere trial when I fail. Can I be satisfied with process, particularly when the price of process is so very dear? A final word about Laman and Lemuel. I could never condone their violence, but at the same time I can’t help but sympathize with them. It wasn’t mere money they lost with Nephi’s desperate gamble. It was their inheritance. Surely there was a significant part of them that held on to the idea that Lehi would come around eventually—or if not, that they would themselves be able to return (alluding here to their next trip). Even camped in the Valley of Lemuel, having determinately acted upon Lehi’s vision, having made as concrete a break as one can make, I suspect they held onto hope for a return. Even if it was mere psychological comfort, I suspect that such a comfort was comforting indeed—they still had an inheritance in the promised land of Jerusalem. Though they’d left it, there was still significant wealth, and that wealth by right of custom belonged to Laman. His whole identity would have been intertwined with the idea that this wealth would one day come to him and with it he would carry on his family legacy in the land of promise. But now it was gone, lost, squandered in stupidity. How much evidence did one need that the “commandments” Lehi and Nephi so adamantly proclaimed were really a form of neurosis, perhaps even blasphemy? God had not prospered their way and sustained their efforts. Quite the opposite. If they’d been satisfied with the first failure, they might have regrouped. Nephi, however, had lost them that chance. Wait, what? I…don’t understand that. Laman was constantly pushing back against his father and even more against his brother. He only ever does a thing grudgingly, and that’s when he does it at all (except perhaps going back to get the daughters of Ishmael; I doubt any of the brothers complained overmuch about that.) Therefore he does not get the blessings. He is angry, he is prideful, and he is murderous when balked in his intent (though that shows up later in the narrative.) When Laban stole their possessions, Laman gets angry with Nephi (and Sam, who by all accounts did nothing at all) and BEATS THEM WITH A STICK. That tells you what you need to know about Laman. He is a bully. When he obeys, if he actually does, we have no indication that he does so for the right reasons. The Lord does not allow one to do the right things for the wrong reasons and still give one credit. The reasons why we do things are often more important than the actual actions themselves. With regard to Cain, he performed his “sacrifice” because satan asked him to, not because God asked it. Is there any wonder why God had not respect for his offering? Cain offered it for the wrong reasons and out of obedience to satan rather than God (remember why the sacrifice was important in the first place). Then, after that failure and after God spoke to Cain and tried to instruct him, Cain listened to satan AGAIN and killed his brother. How is God at all partial and unfair in that scenario? What would a valid alternative course of action have been? I think overly sympathizing with Laman (and certainly Cain) is a dangerous path to go down. It’s understandable, from a certain perspective, and perhaps even somewhat compassionate. But in the end, I don’t think it gains us anything useful and could open doors best left closed. Imagine having a father who had a vision that told him to pack up his family and leave the U.S. — to leave the LDS church even. How could one not have their doubts? To then still be loyal to your father and your family and go with them yet have doubts seems perfectly normally for any mature person. Of course the younger children would be more susceptible of believing everything their father did – that’s just human nature. Even having this thought experiment its hard to conceive of it being what God would want if your a faithful LDS member, yet this is exactly what happens in 1st Nephi. When you really try to put the yourself in their shoes its hard not to have some compassion and understanding for Laman and Lemuel. This isn’t to make Nephi out to be the bad guy its just to have a little more charity for the circumstances that Laman and Lumuel faced being the older brothers. The danger with not sympathizing some with Laman and Lemuel is that we might see them and their choices as something wholly apart from us, something that we would never do, and thus blind ourselves to the fact that we are every day tempted to give in to the same impulses that tragically led Laman and Lemuel. The human mind’s capacity for rationalization and self-justification is so formidable, that if we don’t put ourselves in Laman and Lemuel’s shoes, then we run the risk of seeing ourselves only as Nephi, as only the good guy, never needing repentance, and those who disagree with us as obviously evil. That’s not a good way to live, if we are trying to learn the lessons of the Book of Mormon. If we see that Laman and Lemuel were motivated by the same things that motivate us, then we can use the Book of Mormon as a warning against following those motivations. I don’t think that’s at all a dangerous path, and I think it definitely does give us something useful. This seems a passage that is explicitly paralleling the story of Joseph and his brothers it seems. Right down to the younger brother being a ruler over them. Again we have to pay attention that this account is being written long after the fact. We don’t know the particular events. Still there’s lot to take note of. For one, after an angel appears Laman and Lemuel immediately start complaining again. That’s kind of shocking. The other interesting thing is the use of the phrase “land of inheritance” here compared to say 2 Nephi 1. I’m not quite sure what to make of it but there is definitely a shift. Perhaps a shift tied to the exodus pattern. And Nephi definitely is portraying Jerusalem as a kind of Egypt. There’s odd double moves here. It’s quite complex or at least Nephi’s very ambiguous about all this. Sometimes Jerusalem is Egypt, sometimes it’s still Jerusalem/Zion. Part of this is because two types are at play (Joseph in Egypt, Moses leaving Egypt) Joseph saves his family by bringing them to Egypt. Moses saves Israel by fleeing Egypt. We’ve been focusing on Laman and Lemuel as bad because they desire Jerusalem. But I wonder if we look at Laman and Lemuel not just as the evil Nephi sets himself up against but also his own latent desires. I’m not sure it’s correct to say Nephi has no sympathies with them. It’s just that he does what he is supposed to. Regarding the plates, I’ve been reading N. T. Wright this week again. He suggests that it’s incorrect to see Paul just adopting all these OT types as merely literary types. Rather he sees himself as part of an ongoing revelation of history. Literally he is part of those processes. I think that’s true for Nephi too. He’s trying to see how he fits into this larger tapestry. Regarding Laman and Lemuel’s sacrifices. My suspicion, although Nephi doesn’t quite present it as such, is that Laman and Lemuel were just incompetent. They were partially angry because they didn’t know what to do. They tried, but they tried in a straightforward blunt way. “Hey, just give him everything.” To my ears it’s more like a petulant 4 year old throwing a fit even when they do try. That’s not to dismiss their trying but it’s definitely not trying in the right way. The connection to Cain is interesting and perhaps intended by Nephi. I think James reads Gen 4 incorrectly here. I think he’s missing the nuance of the contrast between the sacrifices of Cain and Able. The idea was that the sacrifice to be a sacrifice was to give your best, which Able did and Cain did not. The whole point is Cain didn’t do what was right in his sacrifice. I think that’s how Nephi sees Laman and Lemuel. Some times there is no A for effort. Your comment on the competence of Laman and Lemuel. On another level, you can look at it that the Brass Plates = Word of God. (1) You can’t simply get the Word of god by merely asking (even Moroni describes the process as “real intent” and Alma says we have to “exercise faith”–sounds like effort to me. (2) You can’t get the Word of God by merely buying it. (3) You often get it once you go forward “not knowing beforehand” what you should do. Kind of a way to view this story. PS. I really enjoy these posts. Not sure how much we’re going along with what James is saying, but I’m sure benefitting a lot. Thanks James (& all). Yeah, I confess I’ve gotten lazy in how I read my scriptures just because I’ve read the Book of Mormon dozens of times. Having to make comments and do a close reading forces me to pay attention to things in a way I haven’t for a while. I think it’s absolutely important to consider Laman and Lemuel’s place in the narrative, because indeed most of us are probably closer to Laman and Lemuel (well, hopefully other than the intended murder parts…) than we are to Nephi. However, there is a difference between attempting to understand them and sympathizing with them too much (I’m not saying that you are, just stating it in general). If we liken the scriptures unto ourselves, it’s partially to emulate good behavior (such as Nephi’s, even though he clearly was not perfect) but also to understand how to avoid poor behavior (such as much, though not all, of the behavior we see from Laman and Lemuel.) Nephi wasn’t perfect and Laman/Lemuel weren’t mustache-twirling villains all the time either, but in the end, Nephi did his best to follow the Lord and Laman/Lemuel, despite some attempts to do so, did not. 1. Regardless of how we got the two Egypt narratives, by Nephi’s time both were likely available and together (although I know some DH theorists put the conjunction/editing as post-exile). As Clark notes, we get an ambiguous parallels here because Nephi himself is ambiguous. It’s clearly a Joseph of Egypt structural narrative, but ends with explicit references to Moses. I think we’ve got two choices in how to read this. We could read this as an unsophisticated Nephi — he really likes both stories and ignores or perhaps doesn’t even see the inconsistencies. 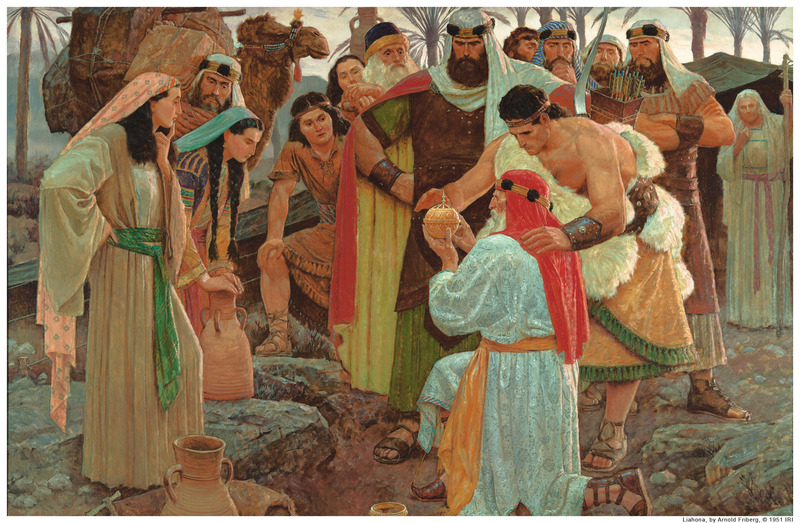 Or we could read it as a sophisticated Nephi, one who sees an unavoidable ambiguity and an unreconcilable situation: God’s asking us to forsake God in order to obtain God; we have to leave the promised land in order to obtain the promised land; I’m Joseph, cast off by my brothers but ultimately this fact allows me to become their teacher and ruler; in addition to being a young arrogant Joseph, I was chosen to usher in deliverance like the old Moses. I’m favoring the latter interpretation. What’s more, I think this is a generalizable situation that we all face or will face. I think it’s the structure of an Abrahamic trial. 2. I really like both of the readings you two give to Laman & Lemuel. Both are plausible and theologically rich and are what one typically encounters in a devotional context. Given what’s written, however, the sophisticated Cain/Able interpretation is anything but self-evident. It requires making a great deal out of a careful linguistic distinction, importing a whole backdrop. We have to do this to make the scriptures breathe in any form, so I don’t mean to criticize that fact. But again, simply taking what’s written we’re not offered justification and there are several plausible alternatives. What we’re actually offered is partiality and mixed messages. Perhaps a deeper message then is that how we choose to make the partial, problematic messages from heaven work — how we choose to interpret and apply them — is a critical matter of both agency and faith. 3. With regard to revelation/scriptural understanding being a matter of not merely asking (Terry, I can’t help but think of Oliver Cowdery here) and not being able to buy the divine truths of the scriptures (can’t help but think of the temple drama), but instead being a matter of making a leap of faith: Following up on this idea, it’s interesting that Nephi registers no protest to merely asking, and it’s his idea to buy the scriptures. So at best we have a confused, ignorant Nephi who learns through a process of failure (or at least, we the reader learn; I’m not sure Nephi is self-effacing enough in the narrative to attribute this interpretation to his careful crafting). At this point we have both another reason to cut Laman and Lemuel some slack — it’s not clear that they did any worse here than Nephi (outside of their violence). But it does look like they missed the opportunity to learn and grow at the rate Nephi did. J Town: I’m certainly not in disagreement with your ultimate conclusion (in #7). I just think you’re missing a great deal of the lessons to learn along the way by merely accepting the narrative exactly as Nephi dictates it; and even worse, applying a rigid/black-and-white structure to the world today. The counter-evidence and weakness of Nephi is clearly on display, despite his best efforts (as are, so I argue here, certain admirable aspects of Laman and Lemuel). Moroni surely alludes to this sort of thing in Mormon 9. But I think we’ve got a much bigger danger than sympathizing with Laman and Lemuel, and that’s failing to love and understand and work with those who we can’t help but see as being like Laman and Lemeul in our own life. And if we can’t learn to feast with publicans, harlots, and sinners, we’ll certainly not stand as saviors on Mount Zion — and perhaps not be able to stand on the Mount at all. J Town, you seem to be taking a very narrow view of what happened in the BoM, while James is simply trying to explore it as a reality. People aren’t black and white like you describe them to be. Do you know anyone who “only ever does a thing grudgingly”? I submit that you do not. Even terribly depressed people or those who feel most victimized in the world can do things for higher and better reasons. The sum of a person is never their worst deeds and I don’t think it’s every dangerous to try to give someone the benefit of the doubt and still try to see where the light of Christ is in them. Because it’s in all of us, right? So I would say perhaps we could all benefit from seeing the people in the BoM as real people rather than one-sided characters in a story. Try it, you might like it. James, I’m not sure what you mean about a sophisticated interpretation of Cain and Able. This seems the emphasis in the text. The other reading seems to make YHWH’s comments to Cain rather confusing. Further the story as presented is almost certainly a kind of parable for how the Israelites should be making their offerings. That is the focus seems to be on a righteous offering and God’s righteousness (think N. T. Wright’s Paul) in accepting it. Now perhaps it’s a composite text. (I don’t recall all the things written about it and I get a little more skeptical about authorship arguments in the particulars even if I buy the idea in the big picture) If so maybe there’s two things going on. A narrative about sacrifice and a narrative about a kind of archetype of murder/selfishness. We don’t know what the text was like for Nephi of course. Regarding the competing narratives, I think that Nephi sees Lehi, not himself, as Moses. It might also reflect a conflict between the initial views when they first left Jerusalem and when the reality sets in when they arrive in America. I wish we had the lost 116 pages to compare 1 Nephi with. James #8. The reading is racing faster than I can properly gather my thoughts, but my thought about the difference between Nephi and Laman and Lemuel is pretty stark. I’m not talking about their flailing around trying to figure out how to get the plates from Laban, its that Nephi has made a covenant with God to get the plates and he WILL keep that covenant. Laman and Lemuel did not and, therefore, do not have the same commitment to getting the plates. THAT’s the difference. They didn’t like the “visionary” nature of the task to begin with. I tried to explain this in the previous post on 1 Ne 3:1-7. For some reason, I feel I may be forcing the language of covenant on Nephi’s comment in v. 7, but it feels right to me in explaining his absolute drive and willingness to do whatever he can think of (and eventually what he can’t) to get the plates. There may be more to the story. Clark. I’d like the 116 pages too, perhaps Don Bradley will shed light on that in his project. However, if I ever saw the Gold Plates themselves, the number one thing I’d want to see is the word that Joseph translated as Christ. Yeah some of Don Bradley’s stuff on the 116 pages are very exciting. Part of me always hopes they’ll be found one day and that Mrs. Harris did not burn them. Be careful about the 116 pages. Remember that way back in the day, Mark Hoffman decided he’d “find” them, sell them to the Church for millions and then expose them. He had his mission companions compiling an index of every word (side note–sounds like the co-editor of the Quran Study Bible from HarperOne I interviewed today and what they did with the Quran) and forged all known exemplars of Martin Harris’ handwriting and stole the endpapers from the time period and developed the ink. Amazing that George Throckmorton and the detectives got all that put together and that the bomb blew up against him when it did. As for the covenant idea, it came to me while reading Kinship by Covenant, Scott W. Hahn (AYBRL, 2009) and Marriage as Covenant, Gordon Huegenberger, (Wipf & Stock, 2014 ed. [orig. 1994]). Far more than a commitment and the covenant is with God. Nephi makes a covenant with God to bring the plates back to his father. Causes me to review my own covenant-making and covenant-keeping. Quite sobering actually. The word I left out is that in my opinion it was unique to the task. I’m sure Bradley will be careful about Hoffmann contamination. As I recall most of his stuff is indirect. Clark, to be brief and candid, I’m saying that your interpretation is indeed an interpretation (though certainly a plausible one). While that’s the Sunday School answer we’ve always heard, the text on its own really is quite confusing. I think it just as plausible and natural to read the text as referring to the chosen nature of Able/Israel — impartiality amongst the Gods wasn’t a high priority then like it is now (but of course, that also requires an interpretive take). Nephi explicitly likens himself and his brothers to Moses here. Overall, perhaps Lehi is meant to come off as Moses — but here he’s trying to inspire his brothers with the analogy. Terry, I like the idea of Nephi having covenanted. In general, I like covenants as a religious response to our finitude. James, I think you then apply some of that to Nephi’s actions. In fact, Laban’s actions may have brought the response from the Spirit using Nephi as the responder. The Book of Mormon IS an Old Testament text and divine retributions often came in ways that we (with our modern paradigms) have trouble relating to or understanding. James (16) Well I’m Nietzschean enough to think it’s all interpretation. (grin) I think we sometimes disparage the sunday school answers. While sometimes they’re superficial that doesn’t mean they’re wrong. They usually end up being reasonable ways to read the text although at times they are wrong precisely because they don’t engage the text closely. The question about divine impartiality is an excellent problem. I’ll confess I don’t buy in the least divine impartiality. It seems built too much out of a kind of Rawlsian veil of ignorance. However if we buy the Mormon gesture towards theodicy then it seems to me this life is a developmental test. In such a case the last thing we should want is a kind of impartiality tied to an “as if” ignorance. Rather we should want a kind of divine partiality that pays attention to our particular developmental needs. In this case in terms of judging God we have no clue what was going on with Nephi, Laman, and Lemuel. In terms of judging good or bad for their spirits we must remain silent. In terms of judging the actions somewhat independent of intent of course we can judge away. I think though we have to recognize these are two different kinds of judgments. To anticipate a challenge, I don’t think things like “God is no respecter of persons” argues against the kind of partiality I outlined. Rather it’s referring to worldly respect. The very idea of Christ’s parable of the lost sheep entails a certain kind of partiality.